We talk with Kate and Bryce Hansen, inventors and creators of the Ergo Spout, all about designing this kitchen tool. 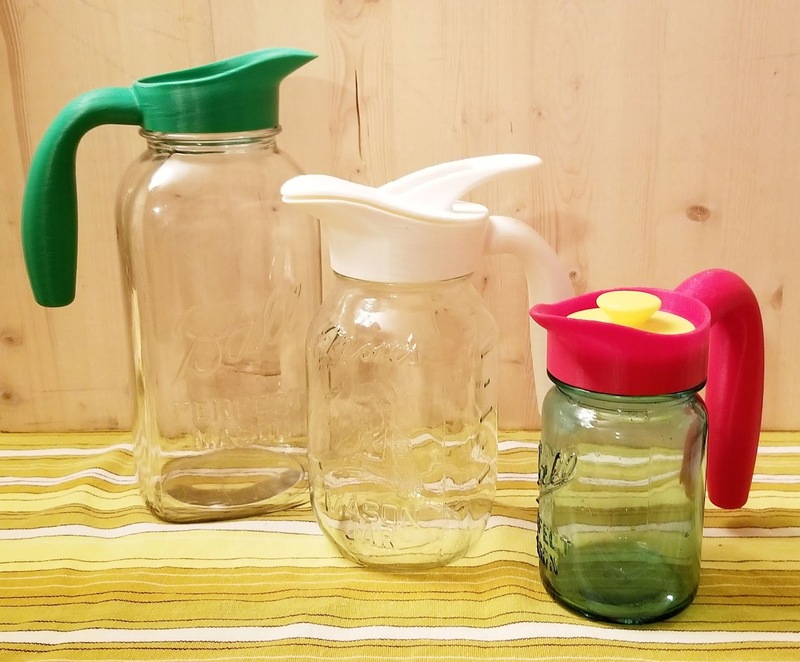 In order to bring this spout that can be used with a regular-mouth Mason jar, they did market research, created prototypes, and hired engineers to eventually get it to a successful Kickstarter campaign. Listeners can still pre-order and get 15% off when you enter the code HUNGRY2 at checkout on their website. Also, Winter and Lee also talk about popcorn popping machines and try out interesting jerky that some listeners sent in! Food Nerd Shoutout: People had definite opinions about cotton candy (aka fairy floss), such as listener Marisa E.G. who loves it, while other listener Nadia G. who was sure she wouldn't like it if she tried it again today. Second shoutout: Leslie and Aaron of the So This is Love Podcast let us know they listened to our episodes on salt (here and here) and finally were able to find and buy this! Let's Dig into the Kitchen Drawer: Lee doesn't like our current home air popcorn popper, the classic Presto PopLite Hot Air Corn Popper, because it spits out so many unpopped kernels. Lee's rating: 1 out of 5 stars. Do you have a popcorn popper that you love? Send us an email at hungrysquared@gmail.com. 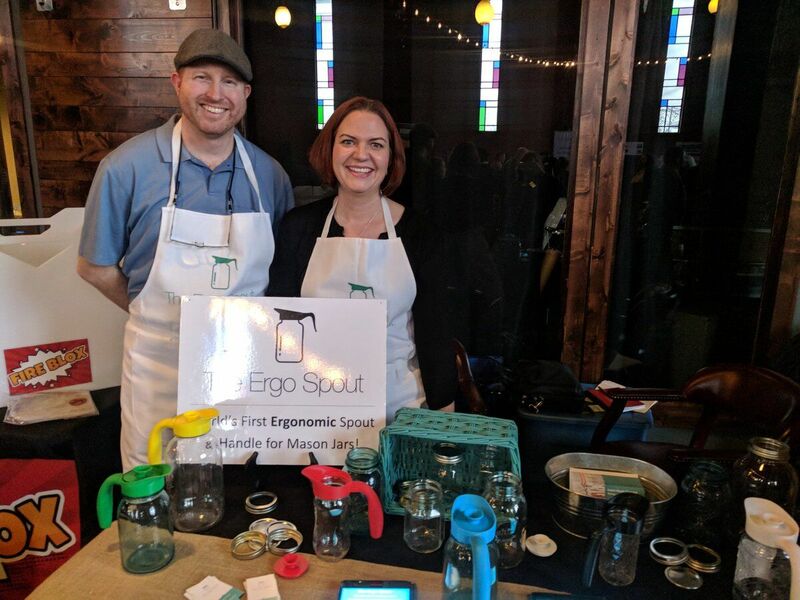 Welcome to Kate and Bryce Hansen, the creators of the Ergo Spout. You can find them at www.Culinesco.com. We met Bryce at the Bountiful Farmers Market while Lee was running his food stand, Bee's Knees Waffles. Kate had a vintage syrup dispenser that she chipped and she was bummed. What I really need is a mason jar! Kate exclaimed. It lead her to search the Internet to see if there was anything out there. There was nothing. 3-D printing made a huge difference in prototyping. They would sometimes do 2-3 different prototypes each week. 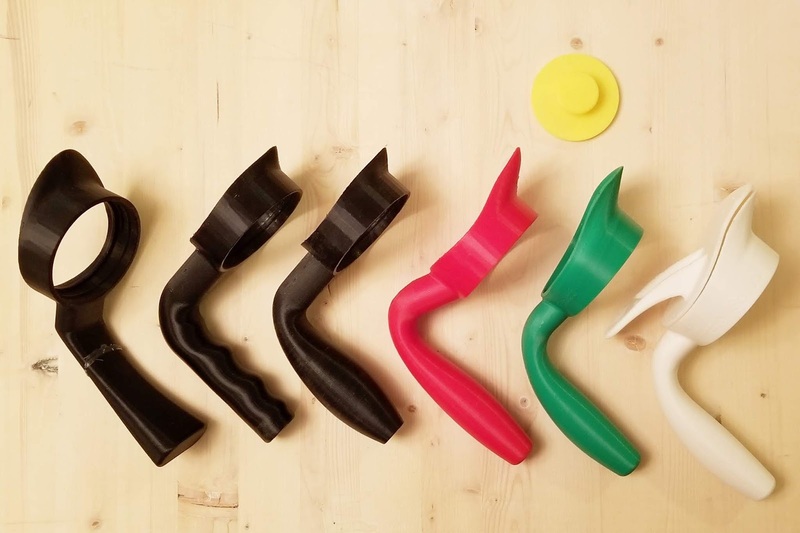 Have you every 3D printed? You can buy a home model 3D printer like this or this. Bryce named it the Ergo Spout, since he is quite particular about how it help in the hand. They showed Winter several prototypes and the evolution from beginning to final product. The lid was the next design challenge. It started out as a little lid that covers the hole only. They eventually moved to a lid that covered the entire spout. They had to hire an industrial designer to help with that flip-top lid. Kate's philosophy of kitchen tools: There's two categories of kitchen tools: 1) Aspirational tools and 2) Enhancement tools. Aspirational tools want to "change your life", but most times don't. Enhancement tools enhances whatever you're doing already in the kitchen and how you cook. Bryce's philosophy of kitchen tools: It's all about the user experience. For example, he loves ice cream scoopers, such as the well-designed Cutco-brand Scoop, the Midnight Scoop, and the Bellaire Scoop. They started finding their tribe and growing their email list through going to farmer's markets, home shows, and Facebook ads. The email list should be 5,000-10,000 big to have an audience when the Kickstarter launched. To be successful with a Kickstarter, the product needs to be somewhat unique, but also somewhat familiar. 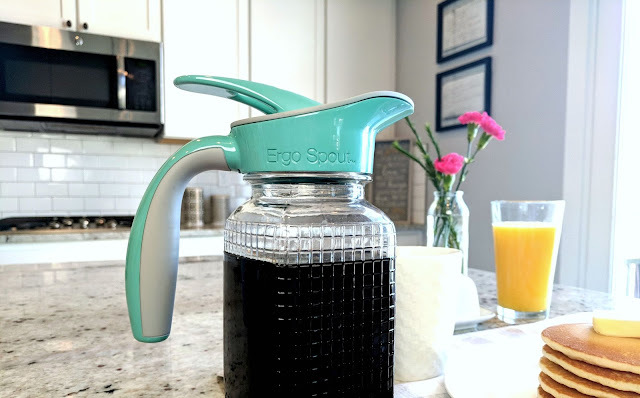 They launched their Ergo Spout Kickstarter July 2, 2018 and was funded in 14 hours. Congrats! They learned that homesteaders want this product. The small dairy industry would really benefit from the Ergo Spout also. They are signed up for the Pinners Conference and Expo in November 2018. But they are looking at advertising online, since there are a lot of option in the digital space. The Ergo Spout fits the regular-sized mouth Mason jars currently. They will be doing their next Kickstarter for the wide-mouthed Mason jars soon. Ball, one of the largest Mason jar manufacturers, only manufactures the half-gallon jars in wide-mouth. Sign up for their newsletter here to stay up to date! The design issue with the Ergo Trap was the difference in the thickness of the inside of jars. Vintage jars have thicker glass on the inside. The outside diameter is generally consistent. 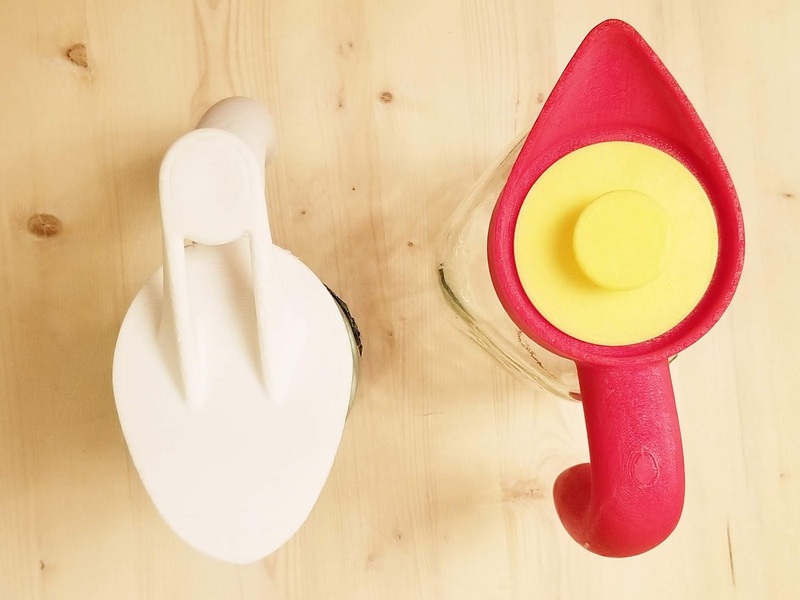 You can preorder your own Ergo Spout (and the Ergo Trap) here. Hungry Squared listeners get 15% off if you enter HUNGRY2 at checkout. Thanks, Kate and Bryce! Introducing Interesting Ingredients: Thanks to our friends, Jamie, Ryan, Bonnie, and James, who gave us some pork jerky made by Wild Stampede from the Beef Jerky Outlet. We tried some Pork/Kangaroo, Pork/Ostrich, and Pork/Alligator jerky. The Pork/Ostrich was Winter's favorite. That was very interesting! You can send us non-perishable food items to PO Box 651652, Salt Lake City, Utah 84165.